Grand Teton National Park is beautiful throughout the year, but fall can be an especially magical time, with smaller crowds of people, greater opportunity to see wildlife and an abundance of contrasting colors throughout the park. 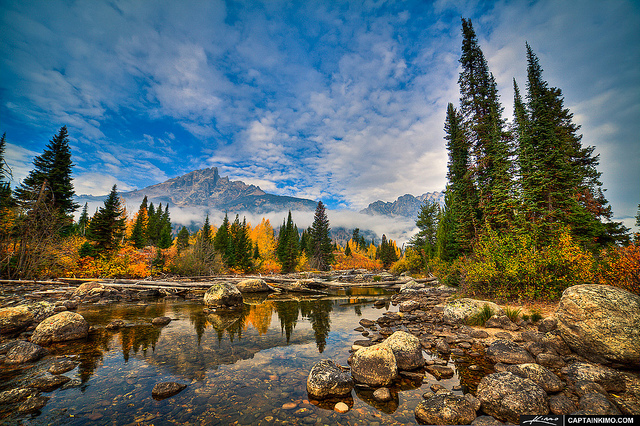 The Teton Range houses many large stands of deciduous trees that turn yellow, orange and red along the steep rugged slopes of the Teton mountains, and throughout the valley, you will find many Aspen groves where golden-colored aspen leaves sparkle against deep blue skies overhead. Cottonwoods line the banks of the Snake River and many species of willows, ferns and other shrubs create a carpet of orange, red an yellow along the lake and canyon trails. Typically the best fall color can be seen in Grand Teton National Park from early September through mid-October, but these dates can vary quite a bit based on the amount of rainfall the area has received, and the overnight temperatures.